Setting up an Equine Hydrotherapy Centre. Whether you own a racing yard, livery stables, a riding school or have an existing equine clinic, an equine therapeutic spa can add a valuable resource to your equine operation. Alternatively, you can build your own specialist equine therapy centre around an equine spa as others are increasingly doing across three continents. 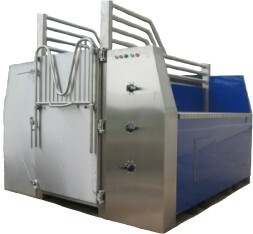 You and your clients can enjoy faster healing of leg injury, faster post operative recovery, improved hoof growth etc. We should first differentiate equine spas from water based exercise units such as equine swimming pools and equine water walkers both of which facilitate controlled exercising of horses. 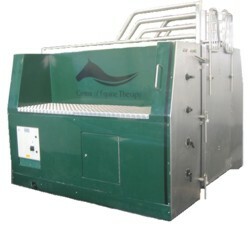 The CET Equine spa however is not used for exercise but is designed specifically for the treatment and prevention of leg injuries in horses such as tendon problems, ligament damage, splints, joint conditions, wind galls, jarring up, lacerations, laminitis, etc. The CET Equine Spa is constructed from high quality stainless steel which combines a pleasing appearance with strength and durability. The pumps, filters and chiller, are specially selected to suit the target market e.g. spas built for the European market will be fitted with top quality European pumps and spas built for the USA market will be fitted with top quality American etc. As all Spas are built to order we can accommodate your special requirements even down to your preferred colour. Tell us what you want! 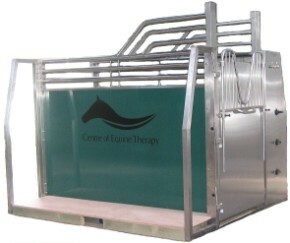 To obtain more information on high quality UK manufactured Equine Spas please complete our Enquiry Form.